In Pennsylvania, the Criminal History Record Information Act, or CHRIA, is the state law that governs the collection, maintenance, dissemination, and use of criminal history record information. Under CHRIA, employers, for hiring purposes, are only allowed to consider felony and misdemeanor convictions; and only to the extent to which they relate to the applicant’s suitability for the specific position in question. If the employer decides not to hire the applicant based, in whole or in part, on the applicant’s criminal history record information, the employer must notify the applicant, in writing, informing the applicant of the decision to do so. PLSE established the Fair Employment Opportunities Project (“FEOP”) to litigate cases on behalf of job applicants whose rights under CHRIA may have been violated. The purpose of the project is develop and strengthen case law construing CHRIA and related statues to benefit future job applicants and employers in Pennsylvania. Do you think you have been unlawfully denied a job based on a background check? Click here to submit an intake form. On April 27, 2016, Outten & Golden, LLP, Philadelphia Lawyers for Social Equity, the Lawyers’ Committee for Civil Rights Under Law, the Public Interest Law Center, and Willig, Williams & Davidson filed a proposed class action lawsuit on behalf of Frank Long and other job applicants similarly effected by the Southeastern Pennsylvania Transportation Authority’s (“SEPTA”) criminal background check policies and practices. The plaintiff alleges that SEPTA violated the Fair Credit Reporting Act by failing to properly inform job applicants like him that it was requesting to run a background check. The plaintiff also alleges that SEPTA violated Pennsylvania’s Criminal History Record Information Act by disqualifying job applicants with unrelated convictions from employment at SEPTA. 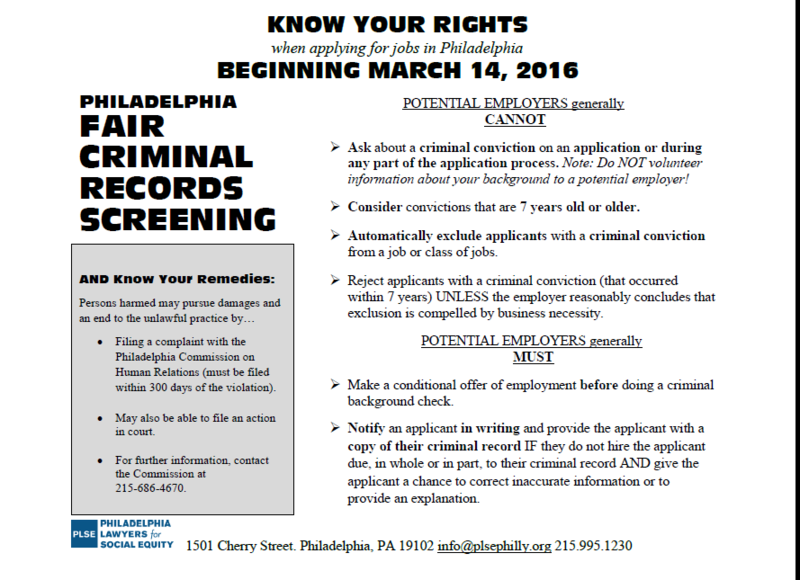 Individuals who applied to work for SEPTA and were denied employment because of their criminal records since 2014 may be eligible to be part of the lawsuit. If the answer to these questions is “yes”, we’d like to talk to you.